Thousands of detainees held in Iraq are still being denied basic human rights with reports of torture rife, Amnesty International has said. It said its interviews with ex-inmates across Iraq had shown the lessons of the Abu Ghraib jail scandal appeared to have been ignored. 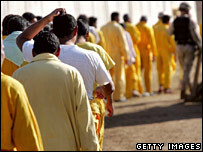 The US and UK insist prisoners are treated to international standards. Iraq's acting human rights minister admitted abuse was continuing but that the government was trying to curb it. Amnesty's report, Beyond Abu Ghraib: Detention and Torture in Iraq, says: "Nearly three years after the US and allied forces invaded Iraq... the human rights situation in the country remains dire." The report says both the multinational forces and Iraqi authorities must take urgent steps to stop abuses if there is to be any hope of halting Iraq's rise in violence and sectarianism. Amnesty says in its 48-page report that thousands of Iraqis are being held without charge or trial. More than 200 detainees have been imprisoned for more than two years and nearly 4,000 for longer than a year, it reports. According to US military authorities, 14,000 Iraqi were in the custody of the international forces in Iraq in November 2005. "To hold this huge number of people without basic legal safeguards is a gross dereliction of responsibility on the part of both the US and UK forces," said Amnesty UK director, Kate Allen. Iraq's acting human rights minister Nermeen Othman told the BBC the interior ministry had admitted abuses have been widespread. "We know that there is abuse, there is violation, there is torturing... in reports we have said that is true. "What we are doing now is to have two high committees in the government to try to prevent this sort of abuse and violation," she said. The Amnesty report mentions the case of one detainee, Kamal Muhammad, a 43-year-old father of 11 held without charge by US forces for more than two years. "His brother reports that he has received insufficient food and has lost some 20 kilos in weight in prison," Amnesty says. Other prisoners were released "without explanation or apology or reparation after months in detention". It reports increasing evidence of torture of detainees by the Iraqi security forces, despite various scandals and promises of investigation and proper treatment. Former detainees told Amnesty they had been beaten with plastic cables, given electric shocks and made to stand in a flooded room as an electrical current was passed through the water. Ms Allen compared the current situation to the Abu Ghraib scandal, which broke when photos were released showing US guards abusing detainees. 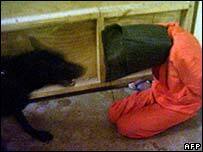 "There are chilling signs that the lessons of Abu Ghraib have not been learnt," she said. "Not only are prisoners being held in defiance of international law but the allegations of torture continue to pour out of Iraq." According to the US military, each detainee is given a form explaining the reasons for their imprisonment and their files are reviewed every 90 to 120 days. The British ministry of defence said allegations of wrongdoing were always taken seriously and international observers were invited into its detention centres. It said that the Red Cross was informed of each detention within 24 hours and the detainee's family was also notified.